7 Influencer Marketing Tactics That Aren't Blogging — CROWD. When you ask if the blogging era is over, you’ll get a variety of answers. According to Sway Group founder and CEO Danielle Wiley, it’s still kicking— but it’s not what it used to be. Bloggers have now shifted into content creators, producing complex online campaigns with different types of media and a mix of brand messaging and their own taste and opinions. Sponsoring an old school blog post is still great, but there’s a greater world of opportunity when it comes to online marketing. 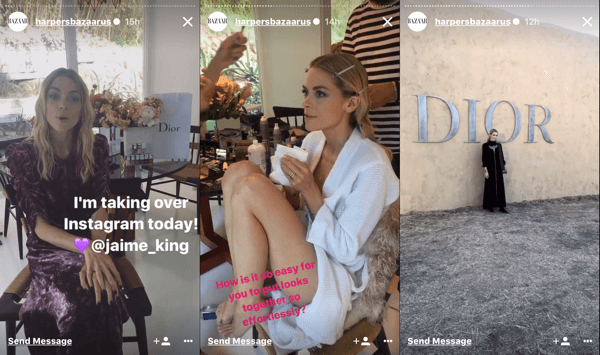 Influencers love to go live on either Facebook or Instagram. Sponsors can capitalize on that level of engagement in a few ways: product unboxing, Q&A, fashion haul try-one, cooking, activity or destination promos, and BTS footage at a big event. In each of these formats, the influencer can creatively and organically mention your brand. This approach works particularly well for new brand partnerships or a partnership that the influencer isn’t always associated with, like a food brand promoting a charity. Podcasts have become a major player in mainstream entertainment. Many influencers and YouTube stars have at least one podcast of their own, and they need advertising. A brand can easily sponsor a podcast that overlaps with their audience, and get promotion either through ad reads or potentially an organic mention or two in the right situation. For example, a parenting podcast could justifiably bring up a particular brand of stroller when talking about going out with their babies. According to a Nielsen report, "The podcast listener tends to spend more at the grocery store on a weekly basis than the average American." With podcast listeners spending more, reaching these audiences is a must for your brand. Brands can sometimes get influencers to work for them directly on a freelance basis. With a contract, influencers can create signature digital content just for your brand. This practice could up a brand’s marketing game with the influencer’s skill set, including photography, writing and videos. And the new content can pull double duty from both the brand and the influencer’s personal pages. A fun stunt that’s becoming more popular is the social media takeover. Brands have started bringing influencers in to temporarily take control of all social media output. This can coincide with a big promotion or just a concerted push for more online engagement. Both influencers and brands can get a boost from this collaboration, as both benefit from greater exposure to new audiences. Influencers are a fixture at major events around the world. If they’re going to be there regardless, they might make for a good brand ambassador. They can take part in trade shows, host parties or simply attend a gathering and post for the brand. An influencer’s community can be a great resource for gathering information on what they’d like to see from new or current products. Easy polls are all over Facebook and Instagram are a quick way to gauge consumer interest. Some influencers have embraced the newsletter as a supplement to their online presence. Getting a sponsorship in an influencer’s newsletter is not much different than getting on a blog, but feels more exclusive and intimate thanks to the more selective audience. As with all modern marketing, it’s crucial that any partnership feels organic. Determine permissions, goals and assets— then let the influencer do their thing.